Below is another article in a series I’m writing for my Red Sox Nation Presidential Campaign. Thank you for voting at www.redsoxnation.com/president, from August 30 to September 9. 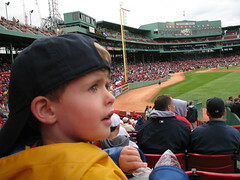 The risk of giving my son his first Fenway experience at the age of three was significant: what if he was too young to appreciate it and remember it? But I was so eager to introduce him to Fenway Park and the Red Sox, I took the gamble on Father’s Day in 2002. And despite the cool, damp weather, we had a fantastic time. He stood the whole game; Cracker Jacks, cotton candy, and Fenway Franks sustained him; he was fascinated by the wave; he loved the chants, the clapping, and singing Take Me Out To the Ballgame; and although he paid little attention to the action and didn’t understand a thing that was going on, he never got bored. After the three-hour game, we had the option of heading home or standing in an incredibly long line under the right field seats to go onto the field for the first ever “Father’s Day catch.” I gave him the options and let him choose. “Let’s go on the field, Daddy!” (What a kid!) We waited and waited, but he never complained. By the time we made it onto the outfield grass, we had been at Fenway for about 4 1/2 hours (which is 9 hours in 3 year-old time). I recall thinking, while rolling balls to him, chasing him, and wrestling with him in the shadow of the Green Monster, that this was my favorite day as a parent. It was surreal. I wished it could last forever. And I hoped my son would remember it, too. This entry was posted in Baseball, Children, Family, Parenting, Red Sox Nation, Sports. Bookmark the permalink. the other person’s web site link on your page at appropriate place and other person will also do same for you.